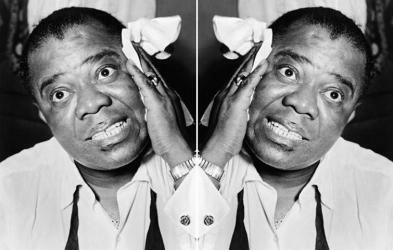 Louis Armstrong and I have similar reactions to soaring temperatures: stunned looks and handkerchiefs. In the Pacific Northwest this year, we've been experiencing the long hot summer. To reference another movie title, most days I think: "Hurry Sundown!" During the almost-constant heatwaves since June, I've discovered I love to wear strong fragrances in the heat: woody/resinous, smoky compositions (is that a forest fire?...or my perfume?) Wearing warm assertive perfumes in summer is like drinking hot tea on a sunny, 90-degree balcony; I imagined misery but, instead, enjoy wallowing in the heat, merging with it instead of fighting it (till a moment comes when I run into the air-conditioned house). Two fragrances I've enjoyed wearing in hot weather are Olfactive Studio Panorama and Fiele Fragrances Myrrha; both accent the heat in a good way. Panorama starts off smelling like an expensive aftershave lotion from the 1960s: lots of citrus, spice and musk. Panorama's bergamot and lemon are syrupy (and prominent) to start but lead quickly to the aromas of heaps of grass and leaf clippings (the wasabi-bamboo accord adds an off-kilter minute or two — a sour/earthy aroma that reminds me of a damp washcloth that's been used one too many times). Hey, what repels in daily life sometimes makes a perfume interesting! As Panorama's greens burn off (or up) I detect heated scents of fir, smoky vanilla and labdanum. Panorama smells incredibly rich but does not last too long on skin (that may be a plus for those of you who like fleeting summer fragrances). To make Panorama last for almost eight hours, employ the perfumista trick: douse yourself with scent and before it dries, put on your shirt. (Having a hairy chest probably helps prolong the scent, too). Panorama would be great to wear at the beach, on a mountain hike, while riding a ferris wheel or out to dinner — it's versatile. Olfactive Studio Panorama is available in 50 ($145) or 100 ($195) ml Eau de Parfum. For buying information, see the listing for Olfactive Studio under Perfume Houses. One scent I always associate with hot summer is jasmine; my garden varieties are usually pumping out fragrance during sultry evenings, their aromas creeping into the house (having bad insulation helps). Myrrha mixes rich and beautiful notes of myrrh, jasmine and milky woods (with a touch of sweet patchouli) into a heady skin scent. Myrrha is a great perfume to wear on "hot" dates or when you feel (or want to feel) you are irresistible: a heat-generating personality. I plan on wearing Myrrha this fall and winter during my gallery talks on Impressionism at the Seattle Art Museum; Myrrha's vibrant (and vibrating) myrrh-jasmine embrace will add an "extra something" to the bright, colorful visions of Morisot, Pissarro, Renoir, Monet et al. 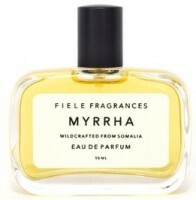 Fiele Fragrances Myrrha is available at the brand's website in 50 ml Eau de Toilette, $85. Note: top image of Louis Armstrong [altered] by Herman Hiller via Wikimedia Commons. Ah, the damp washcloth. Has my next wearing of Panorama thus been sullied? But I agree the opening evokes more that moment of crushing between your fingers a leaf belonging to a weed instead of a herb. I’m also enjoying Ombre Indigo and think that would work well on a hot date (temporally speaking). Uday…yes, that is a good one, too. Thanks, Kevin. I know I won’t always like everything you like, but in this case, samples ordered. Oh that Myrrha sounds delish! Panorama is $145 for 50ml, $195 for 100ml, at least at Luckyscent. I came across some Olfactive Studios scents at Barneys, and they all smelled interesting, so I guess I need to get some samples. It’s the usual problem, which one of 8 does one prefer? If they only had one, I probably would have bought it then and there. Thanks so much Rick, verified and updated the size/prices. Both of these scents sound pretty interesting, but I’m now really intrigued with the Fiele line, which I hadn’t heard of at all. I’m toying with ordering the sample pack, as Myrrha, Cedrus, and Viola all sound somewhat good to me. A myrrh and jasmine combination definitely seems unique, and myrrh is one of my favorite resinous scents. Thanks for the review and for bringing Fiele to my attention. Joe…I think the sample pack will please you…I’ve enjoyed all the Fiele perfumes. Oh, and I’ve really been craving jasmine this summer so the Myrrah has especially caught my attentions. . .
Oh and hey, to anyone else curious to sample, I just noticed on the Fiele website that they are available in shops around the US–including five locations for me here in Portland! Rather, 5 in Oregon (3 in Portland). MR…I know, you’ve had it worse than Seattle…usually 10 degrees hotter!!!!! Ahhh… I grew up in Washington. My parents still live in Washington and keep telling me about how hot it is. Being in MD, I would still prefer that AC-less dry heat than the muggy summers we have, but alas, I digress. Myrrha sounds completely and utterly divine. I’m not sure if I’ll ever get to try it, but I sure hope I do. Thanks for the reviews, Kevin! Yes! A dry heat is so much better than wet heat/humidity, IMO. Kevin, my brother lives in one of those 1920s brick buildings on Queen Anne (with, heaven help him, a western exposure!) so I’ve been hearing about what an oven the PNW has been. Didn’t used to be that way……anyhow, I’ve grown to love incense in the heat; PdE’s Wazamba being my favorite. But myrrh-jasmine sounds like a winning combo, so I need to sample that. I’m coming home this fall, so will definitely see the exhibit at SAM. Thanks for the heads-up. Aparatchick…your poor brother. I hope this is not a trend…where must I move to stay cool in summer???? Alaska? Another melting Seattleite here I like wearing Amoureuse in the really hot weather – it completely blows up (in a good way). Huge SAM fan – really enjoying the mask exhibit! What perfume are you planning on wearing for the Yves Saint Laurent exhibit? Eliza…ha! I will be touring the YSL exhibit…wish I had an OLD bottle of YSL Homme. I’ve not heard of Fiele Fragrances, though Viola and Juniperus sound interesting as well. I think I need the sample pack as well, though perhaps a trip to the stockist in Kansas City would be more fun… thanks for letting us know about this line!